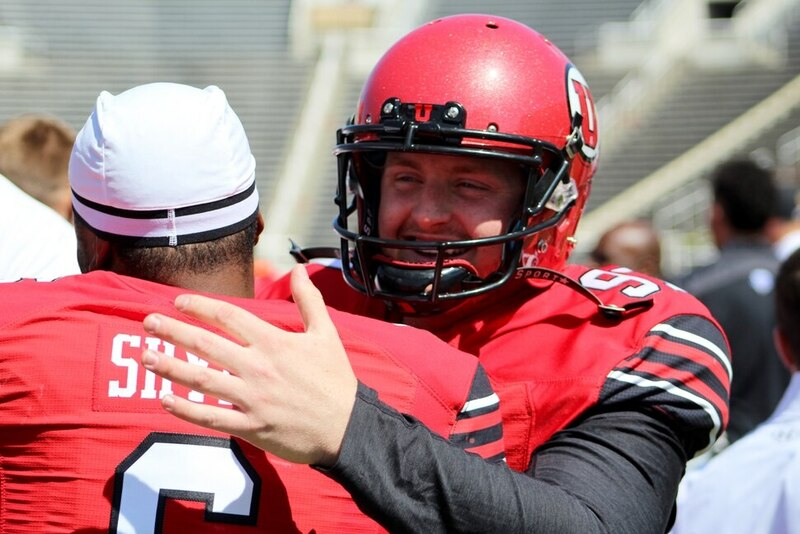 (Christopher Kamrani | The Salt Lake Tribune) Utah kicker Matt Gay is congratulated by running back Armand Shyne after Gay drilled a game-winning 57-yard field goal to win Utah's Red-White game Saturday afternoon at Rice-Eccles Stadium. (Christopher Kamrani | The Salt Lake Tribune) Utah kicker Matt Gay is congratulated by quarterback Jason Shelley after Gay drilled a game-winning 57-yard field goal to win Utah's Red-White game Saturday afternoon at Rice-Eccles Stadium. (Christopher Kamrani | The Salt Lake Tribune) Utah wide receiver Jameson Field celebrates his fourth quarter touchdown reception in the Utah Red-White game Saturday afternoon at Rice-Eccles Stadium. (Christopher Kamrani | The Salt Lake Tribune) Utah defensive back Terrell Burgess (26) celebrates his interception with teammates Siaosi Mariner, Javelin Guidry and Tyler Huntley in Saturday's Red-White game at Rice-Eccles Stadium. (Christopher Kamrani | The Salt Lake Tribune) Utah wide receiver Demari Simpkins celebrates Jake Jackson's 49-yard touchdown in the second quarter of the Utah Red-White game Saturday afternoon at Rice-Eccles Stadium. (Christopher Kamrani | The Salt Lake Tribune) Utah quarterback Tyler Huntley (1) and center Lo Falemaka (right) dance on the sidelines during Utah's Red-White game Saturday afternoon at Rice-Eccles Stadium. (Christopher Kamrani | The Salt Lake Tribune) Utah associate head coach Gary Andersen looks on as his side, the Red team, looks to score in Utah's Red-White game Saturday afternoon at Rice-Eccles Stadium. (Christopher Kamrani | The Salt Lake Tribune) Utah head coach Kyle Whittingham looks on from the north end zone of Utah's Red-White game Saturday afternoon at Rice-Eccles Stadium. (Christopher Kamrani | The Salt Lake Tribune) Utah quarterback Jack Tuttle drops back to pass in the first half of Utah's Red-White game Saturday afternoon at Rice-Eccles Stadium. (Christopher Kamrani | The Salt Lake Tribune) Utah punter Mitch Wishnowsky practices punts into the net during the first half of Utah's Red-White game Saturday afternoon at Rice-Eccles Stadium. (Christopher Kamrani | The Salt Lake Tribune) Utah quarterback Jack Tuttle warms up prior to Utah's Red-White game Saturday afternoon at Rice-Eccles Stadium. (Christopher Kamrani | The Salt Lake Tribune) Utah wide receiver Jaylen Dixon warms up prior to Utah's Red-White game Saturday afternoon at Rice-Eccles Stadium. (Christopher Kamrani | The Salt Lake Tribune) Utah quarterback Tyler Huntley warms up prior to Utah's Red-White game Saturday afternoon at Rice-Eccles Stadium. (Christopher Kamrani | The Salt Lake Tribune) Utah's White squad warms up prior to the Utah Red-White game Saturday afternoon at Rice-Eccles Stadium. Terrell Burgess wanted his own personal review. 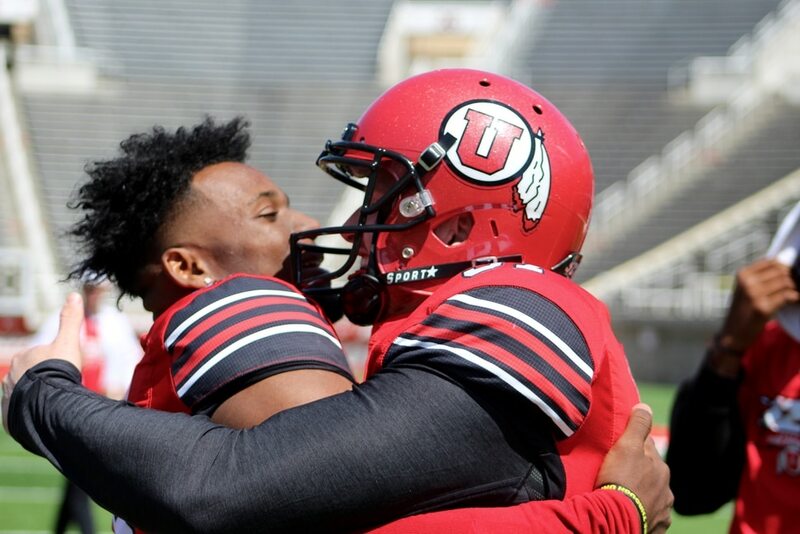 He had a front-row seat to a last-minute two-point conversion by teammate Jaylen Dixon in Saturday’s Red-White game at Rice-Eccles Stadium, a somewhat controversial snag that put the White squad up 23-22 with 33 seconds left on the clock. So right there, the junior defensive back found Utah’s video equipment guy, and asked for a replay. The call stood, but one of Utah’s several key returners in what might be its most talented defensive back group ever stood nearby as the camera rewound and played it back. “I don’t think he caught it clean, to be honest,” Burgess said. In the end, Burgess was part of the swarm of red sprinting around in circles on the home turf, celebrating Matt Gay’s 57-yard field goal as time expired. Burgess is all smiles heading into the summer and fall camp. The junior from San Marcos, Calif., will be called upon to step into any number of positions next season having learned the ins-and-outs of cornerback, nickel back, and now, free safety. (Christopher Kamrani | The Salt Lake Tribune) Utah defensive back Terrell Burgess is mobbed by teammates after making an interception in Utah's Red-White game Saturday afternoon at Rice-Eccles Stadium. Burgess, who finished with a team-high six tackles as well as an interception that he nearly returned for a touchdown in the Red-White game Saturday, is out to be atop the position battle. 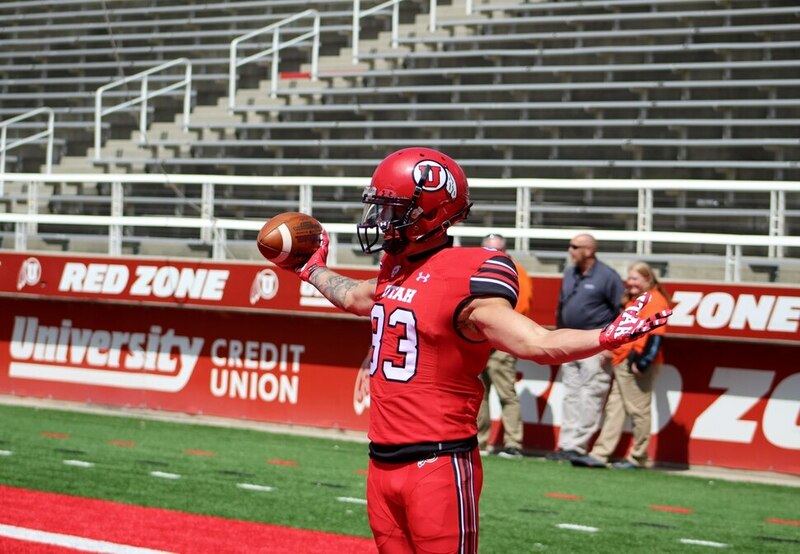 When he first got to Utah, he was a cornerback, then was briefly moved to receiver, before being moved back to corner and is now going to contend for one of two starting safety spots. 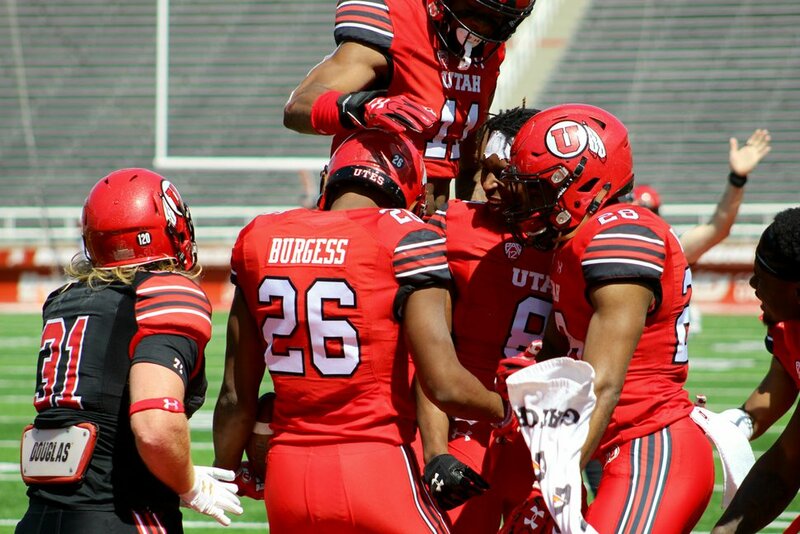 Utah coach Kyle Whittingham thinks Burgess, who played in all 13 games a year ago, can make some noise next season.